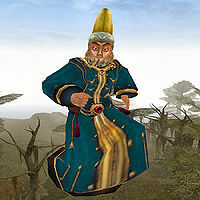 Tarhiel is a Bosmer enchanter who falls from the sky in the Bitter Coast near Seyda Neen after an experiment went wrong. He is the proud creator of the Scrolls of Icarian Flight, which fortify your Acrobatics by 1000 pts for 7 seconds. In his eagerness to test them, he forgot to take the landing into consideration, with disastrous results. Tarhiel is wearing an extravagant robe with matching shoes and a Colovian fur helm. He also carries some gold and three Scrolls of Icarian Flight. You can save his life by casting a large-area Slowfall spell on the area where he's falling. There's little reason to do this, however, as you won't be able to get his enchanted sword and scrolls as easily. He isn't very talkative when you save his life; the only thing he says is "I don't want to talk about it", and then he'll immediately end the conversation. [Upon reaching his "location".] "WAAAAAAAOOOOOOOOOOAAAAAAAAAGGGHHHHHH!!!!!" followed by "AAAAAAARRRRRRGGGGGGGGGGGGGGGGGGGG!!!!!!" [Upon speaking to Tarhiel.] "I don't want to talk about it." Surprisingly, Tarhiel is actually a merchant, and would also provide smithing services. Unfortunately, there is no way to take advantage of these services as you can't converse with him. And even if you got past that (for example by stripping all your equipment off, which would replace his dialogue with "Cover yourself! Are you mad? Have you no decency?") he has nothing to sell, and no gold with which to buy things. You can read about his experiments in his journal, located next to his body. Tarhiel's screams as he falls are actually spoken by the player, rather than Tarhiel - this is done presumably to enable you to hear them. This page was last modified on 10 August 2018, at 23:28.